Peter Henry Emerson was a pioneer in 19th and early 20th century photography. Developer of the photography technique known as “differential focus,” Peter Henry Emerson was a pioneer in the 19th century and early 20th century photography. He was a distant cousin of the famous American writer, Ralph Waldo Emerson and was born in Cuba in 1856. He came to the United States as a young boy and was sent to England for his education. There, he developed a deep interest in photography and worked closely with Thomas Frederick Goodall, an English painter and photographer. Emerson advocated photographing people and objects as they really were, not after being carefully planned and staged. Emerson held that photographs should be sharp only in regard to the critical point of the viewer’s focus of interest (differential focus). Ironically, except for several of his thousands of photos, all are sharp, overall. 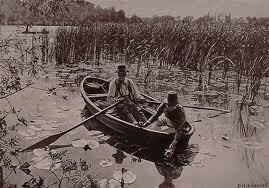 An example of this is found in his sharp photo, “In the Barley Harvest,” which he shot in 1888. Perfectly centered are three men, in a field. One is sharpening his scythe; a second man, standing beside him, is apparently chastising the third man, who is sitting in a leisure position on the ground. The viewer infers from the photo that there is much work to be done, and that the man sitting on the ground is not pulling his weight. Still, one of Emerson’s greatest achievements was to help photography break away from the rules of painting and other forms of art, which had ruled the fledgling art of photography from its inception in the mid-19th century. Emerson successfully argued that photography had its own rules and did not have to follow those of painting. In fact, Emerson’s tenets regarding photography’s rules were embraced by both Alfred Stieglitz and Edward Weston, both of whom led their own schools of photography, following in Emerson’s footsteps in the first 40 years of the 20th century. More than 20 years later, photographer Irv Lawres refined Emerson’s concept. He stated that photographs must portray a person as looking into the picture, rather than looking out, as artists tend to paint their subjects. Art from 20th Century Western Civilization reveals a variety of artistic techniques and content that demonstrates the economic, political, philosophical and religious thoughts of societies during the period. Eudora Welty - Eudora Welty research papers discuss American writer and photographer, winner of the Pulitzer Prize, and Presidential Medal of Freedom and the Order of the South, Eudora Welty. Lewis Carroll - Lewis Carroll Research Papers examine a man well known for Alice in Wonderland who also had interests in mathematics, photography, and puzzles. Allan D’Arcangelo- Allan D’Arcangelo Research Paper goes into the life and work of this pop artist, and discuss several of his creations. Andy Warhol - One of the greatest contemporary artists. Paper Masters gives a topic suggestions on this pop artist and how to start your research paper on Andy Warhol. Paper Masters writes custom research papers on Peter Henry Emerson and looks at a photographer and the developer of the technique of differential focus.